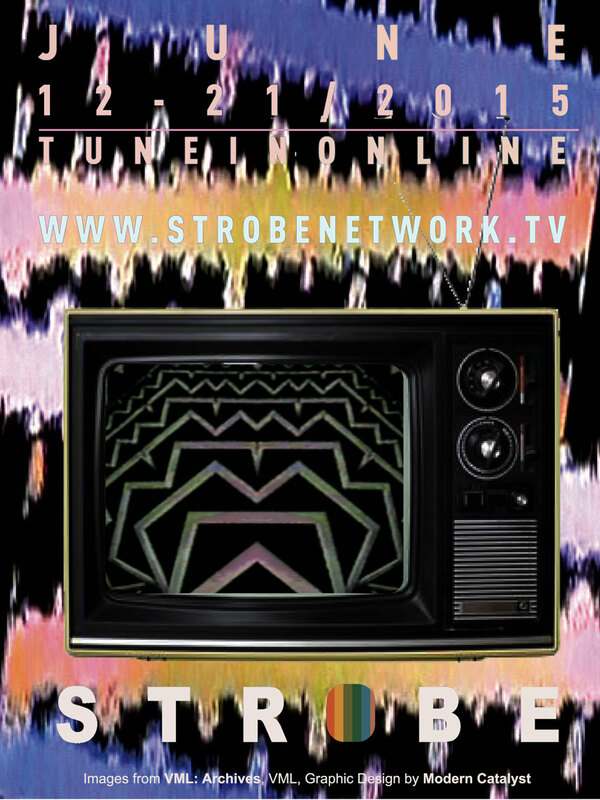 STROBE Network is a temporary broadcast network that will air via a digital streaming platform, featuring artworks that make use of broadcast as an artistic medium. The content has been programmed through an open call and the Flux Factory community at large, including work from 75+ artists. STROBE Network will create and distribute an alternate reality version of mass culture that is free, conscious, experimental, and uncensored. 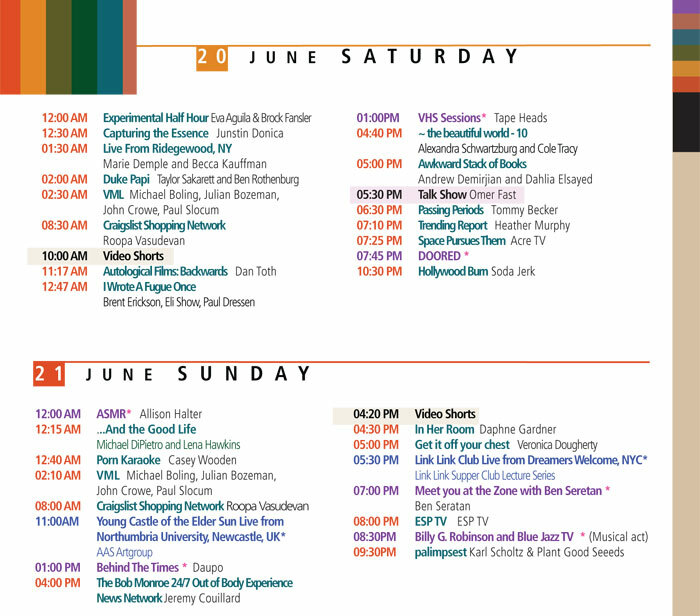 Streaming 24/7 for ten days, STROBE Network will feature video art, performance, animation, talk shows, and music, as well as archival materials from Performa, VML, and ESP TV. 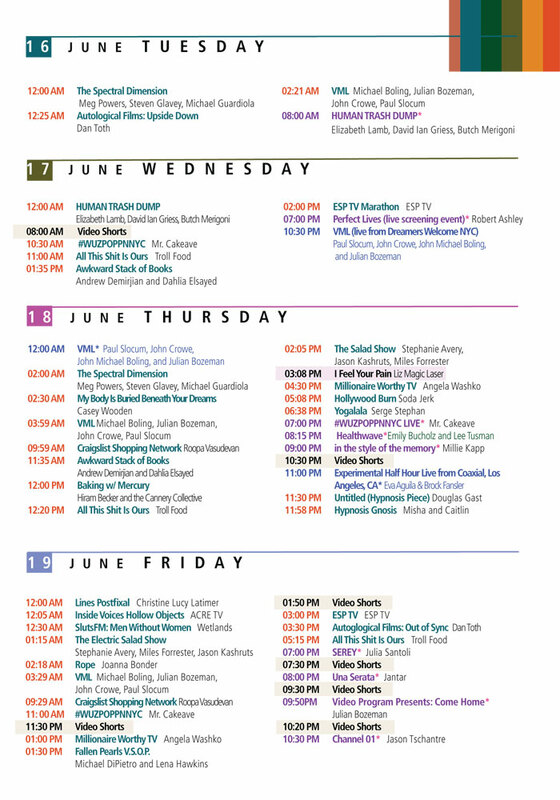 STROBE Network will stream from June 12th-21st via strobenetwork.tv. In addition to streaming via our website, we will welcome a studio audience for live tapings on select evenings at our sound stage in the Flux Factory gallery in Long Island City. Off-site spaces will host viewing parties and Strobe TV Toilet Viewing Station at Silent Barn, Brooklyn, NY. 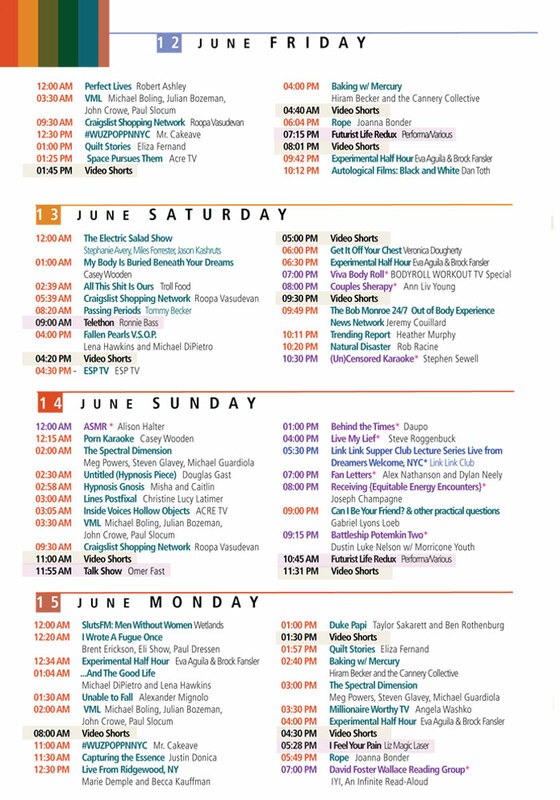 STROBE Network is part of Flux Factory’s 2015 programing. Flux Factory is a non-profit art organization that supports and promotes emerging artists through exhibitions, commissions, residencies, and collaborative opportunities. Flux Factory is guided by its passion to nurture the creative process, and knows that this process does not happen in a vacuum but rather through a network of peers and through resource-sharing. Flux Factory functions as an incubation and laboratory space for the creation of artworks that are in dialogue with the physical, social, and cultural spheres of New York City (though collaborations may start in NY and stretch far beyond). Aas Artgroup, ACRE TV, Robert Ashley, Stephanie Avery, Gili Avissar, Hiram Becker & The Cannery Collective, Tommy Becker, Benna aka Benna Gaean Maris, Billy Robinson and Blue Jazz TV, Aliya Bonar, Joanna Bonder, Julian Bozeman, Emily Bucholz and Lee Tusman, Jeremy Couillard, John Crowe, Daupo, the David Foster Wallace Reading Group (DFWRG), Andrew Demirjian and Dahlia Elsayed, Marie Demple and Becca Kauffman, Michael DiPietro and Lena Hawkins, Justin Donica, Veronica Dougherty, Eric Barry Drasin, Dreamers Welcome, Jason Eppink, ESP TV, The Experimental Half Hour, Fan Letters: Alex Nathanson and Dylan Neely, Eliza Fernand, Caitlin Foley and Misha Rabinovich, Miles Forrester, Daphne Gardner, Douglas Gast, Steven Glavey, Michael Guardiola, Allison Halter, Rui Hu, HUMAN TRASH DUMP, Tatiana Istomina, JANTAR, Zuzanna Juszkiewicz, Millie Kapp, Heather Kapplow, Jason Kashruts, Jemila MacEwan, Christine Laquet, Christine Lucy Latimer, Ayden LeRoux, Phuc Lee, Life of a Craphead, Tzu Huan Lin, Christopher Lineberry, Talia Link, Link Link Club, Gabriel Lyons Loeb, Shehrezad Maher, Steve Maher, Wesley Marcarelli, Amelia Marzec, Alexander Mignolo, Heather Murphy, MVY, Joas Nebe, Dustin Luke Nelson and Morricone Youth, Aaron Oldenburg, Will Owen, Duke Papi, Ella Phillips, Meg Powers, Xiaoshi Vivian Vivian Qin, Rob Racine, Mark Regester and nonnon, Steve Roggenbuck, Amanda Ryan, Taylor Sakarett, Mauricio Sanhueza, Julia Santoli, Karl Scholz & plant good seeeds, Alexandra Schwartzberg and Cole Tracy, Ben Seretan, Stephen Sewell, Josephine Skinner, Soda Jerk, Serge Stephan, Kristoff Steinruck, The Sunview Luncheonette, Dan Toth, Troll Food, Jason Tschantre, Roopa Vasudevan, VML, Viva Body Roll, Georgia Wall, Angela Washko, Wetlands, Barry Whittaker, Casey Wooden, WUZPOPPNNY, Ann Liv Young. Featuring content from the Performa archives by Ronnie Bass, Omer Fast, Liz Magic Laser, and more! For press and general inquiries, please contact strobe@fluxfactory.org. RSVP on Facebook & view a complete list of events here.